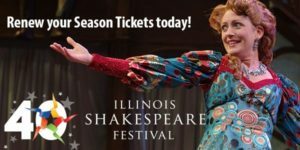 Enjoy drama, comedy, and a healthy dose of The Bard during this summer’s Illinois Shakespeare Festival, June 28-August 12, 2017. The festival takes place at theaters in Bloomington and Normal. If you book a room at the Vrooman Mansion in Bloomington, you’ll be handy to both venues. This annual fest has grown out of a modest beginning back in 1978 when performances were held on the tennis courts of Ewing Manor, and visitors sat on folding chairs. 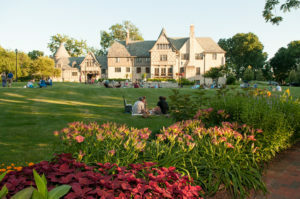 Today’s settings are much more comfortable—the open-air Theater at Ewing Manor in Bloomington and the Westhoff Theater on the Illinois State University campus in Normal. Over its nearly 40 year history, the theater company has produced all but two of Shakespeare’s plays, and has staged several—such as Midsummer Night’s Dream—multiple times. The company is comprised of professional actors along with some interns, and draws an audience from across the state and beyond. As always, this summer’s lineup combines perennial favorites with lesser known plays, offering a little something for everyone. A Midsummer Night’s Dream. A madcap, family-friendly play where four young lovers encounter trickery, forgery, laughs, and romance in a forest. Shakespeare’s Amazing Cymbaline. A fantastical adaptation by Chris Coleman that has all the components of a great fairy tale romance—a brilliant princess, evil queen, and down-right rotten clown. I Heart Juliet. You know the real story, now enjoy a lively, thoroughly modern version by the Q Brothers Collective, complete with hip-hop verse. The Improvised Shakespeare Company. Plays are created based on audience suggestions, so characters, dialogue, and even the story are all on-the-spot original. Sleeping Beauty. An evil Griselda, two good fairies, and a magical frog will delight in this twist of the beloved fairly tale. Where better to stay after a Shakespeare play than a home steeped in romance! Convenient to both theaters, the Vrooman Mansion is a historic bed and breakfast located in a quiet Bloomington neighborhood and features seven suites, each with its own theme. IMAGES COURTESY OF THE ILLINOIS SHAKESPEARE FESTIVAL. This entry was posted in Art and Music, Festival and tagged Festival, Illinois Bed & Breakfasts, Music & Theater by admin. Bookmark the permalink.